This Performer Premium Charcoal Grill is outfitted with innovative heavy-duty Gourmet BBQ System cooking grates, a classic porcelain-enameled bowl and lid with a One-Touch cleaning system and a high capacity ash catcher that makes clean up hassle-free. Storage options are plentiful with the CharBin storage container which protects your charcoal from the elements, and a sturdy painted metal table is right at hand while grilling. Also features a wire bottom shelf, no-rust aluminum vent and a glass-reinforced nylon lid handle with heat shield. The Smart Space Living 2-Burner Propane Gas BBQ from Dyna-Glo allows you to maximize smaller patio and deck spaces for good times over great flavours all year long. With 30,000 total BTUs over 350 sq. inch of primary cooking space (467 sq. inch total), this grill offers quality and performance. It distributes heat evenly with2 stainless steel P-shaped burners protected by two porcelain-enamelled steel heat tents. The grill also includes cast aluminum end caps for stability, along with a temperature gauge to monitor your cooking temperatures. The control panel includes dials with a bezel base and an easy push-button electronic ignition for hassle-free starts and quick heat adjustments. Two side shelves provide space for food preparation and drop down easily when the grill is not in use. Side utility hooks keep your grilling tools within arm's reach. Inside the cabinet assembly, an open slot allows the propane (LP) tank to stay securely in place. Performer Premium 22-inch Charcoal BBQ in Black This Performer Premium Charcoal Grill is outfitted with innovative heavy-duty Gourmet BBQ System cooking grates, a classic porcelain-enameled bowl and lid with a One-Touch cleaning system and a high capacity ash catcher that makes clean up hassle-free. Storage options are plentiful with the CharBin storage container which protects your charcoal from the elements, and a sturdy painted metal table is right at hand while grilling. Also features a wire bottom shelf, no-rust aluminum vent and a glass-reinforced nylon lid handle with heat shield. 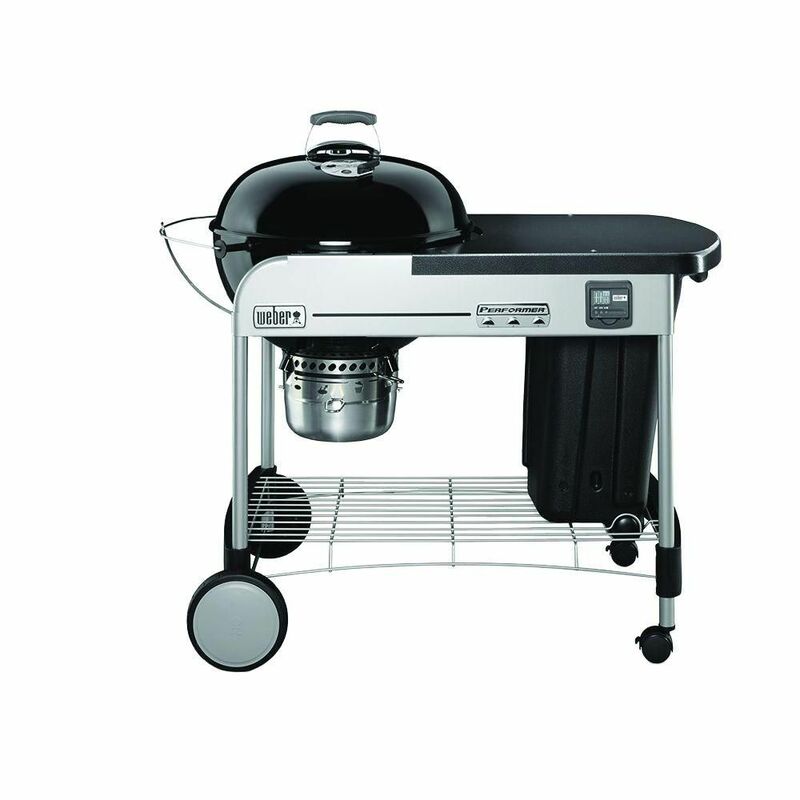 Performer Premium 22-inch Charcoal BBQ in Black is rated 4.7 out of 5 by 261. Rated 5 out of 5 by Robert from Excellent grill, instructions were easy. Very easy to start charcoal.... Excellent grill, instructions were easy. Very easy to start charcoal. Easy to cook on. Rated 5 out of 5 by Luge from The Best Barbecue! I bought this last spring. It is the best barbecue I have ever purchased. Heat retention and distribution is great. Rated 5 out of 5 by AMarshall from Exceptional quality I bought my Weber last year and have been itching all winter to get to use it again. Took the cover off last week and it was just as I'd put it away. I was intimidated at first, as I'd always used propane. So glad I pushed myself. Rated 2 out of 5 by Jim from I had to replace the aluminum support brackets and ash... I had to replace the aluminum support brackets and ash catcher as soon as I tried to assemble the product. The ash catcher was bent and both support brackets had stripped screw holes. Weber replaced all defective parts. The new ash catcher still does not fit as good as the older model. Rated 5 out of 5 by Smokinjohn from Awesome cooker This is my second Performer I’ve own and like the first one it is an awesome cooker. The quality of the product is outstanding and the various accessories makes the unit versitile and cooking easy. The Performer has everything at your fingertip from charcoal bin to tabletop; the lid holder allows quick access to the grill surface to check on food.